Runway Story is one of the best story-based match-3 puzzle games on Android. 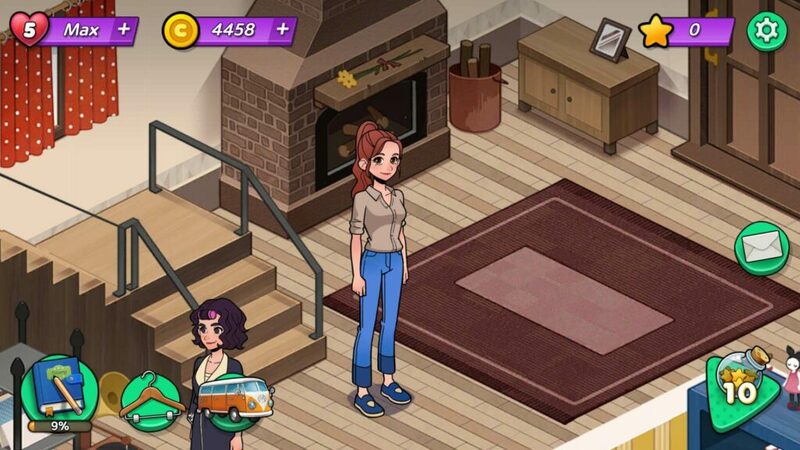 The game follows the wonderful adventure of Jamie, a fashion lover. You will have to help her and her brother Jerome design lovely costumes and accessories for everyone they meet to fill their lives with happiness and color. As Jamie meets interesting characters, she will note down their complaints and demands on her “To-Do List”. 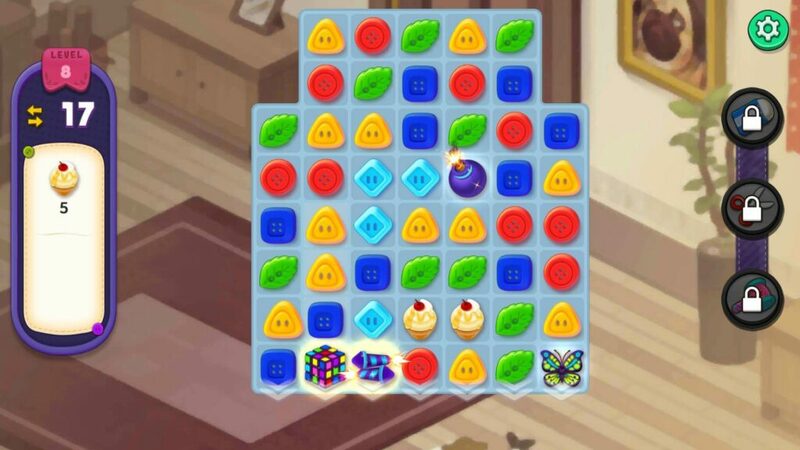 You will have to clear match-3 puzzle levels to get stars, which you can use to complete tasks in her to-do list. There are lots of challenging and fun match 3 levels, each with a unique objective. 1. Look before you Match! You will have to complete all objectives in a level before running out of moves. 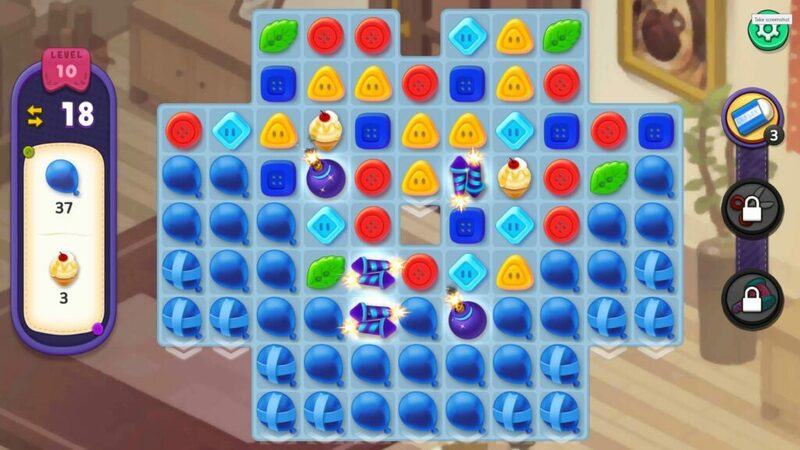 It won’t be easy to clear a level as sometimes luck plays a big part in a match-3 game. However, if you want to increase the chances of winning one, you should look for longer button matches. Power-ups contribute big time to faster level completion, so before matching buttons, you should first scan the board to see if you can match 4 or more buttons to create power-ups. You should then use power-ups at the right time to complete your objectives. This can be done by combining two power-ups by bringing them adjacent to each other or when there’s a big opportunity to clear a lot of buttons or obstacles that are required to clear a level’s objective. Of course it depends on the objectives in hand, and Runway Story has various objectives, each reserved for a particular level. Depending on a level’s objectives, you should focus on your matches and power-ups. Most levels are not time-based, but move-based so take your time and match only those buttons that will help you complete objectives faster. Firecracker: Match 4 buttons of the same color in a row or column to create a firecracker. Now swap a firecracker a button of any color or double-tap it to clear an entire row or column of buttons. If you match 4 buttons in a row, you will create a vertical firecracker which will clear a column when ignited. If you match 4 buttons in a column, you will create a horizontal firecracker that will clear a row of buttons. Bomb: Match 5 buttons in a T or L shape to create a bomb. A bomb explodes when you double tap it, destroying several buttons around it. Butterfly: Match 4 buttons in a square shape to create a butterfly. When you double-tap it, it explodes, clearing a few surrounding buttons and then flies to a random button or obstacle to remove it from a game board. The explosion radius of a butterfly is smaller than a bomb, but it can be extremely useful as it has a double impact on blocks on a game board. Puzzle Cube: When you line up 5 buttons of the same color in a straight line, horizontally or vertically, you create a puzzle cube. A puzzle cube cannot be activated by double-tapping it. You will have to swap its place with an adjacent button to clear all buttons of that color. So, if you swap it with a red button, then all red buttons will be removed from the game board. Bombs have a large explosion radius, which is why they are best for clearing several blocks or obstacles at once. When you create a bomb, don’t just detonate it right away. Make sure it’s closer to several obstacles. If it isn’t, then you can clear buttons around it or underneath it to bring the bomb in close proximity to a cluster of obstacles on the game board. Now double-tap it to detonate it to destroy all obstacles in a 10×10 radius. 4. Butterfly Power-Ups are Underrated! Yes, that’s true. Butterflies are not bombs or firecrackers that can clear several blocks at once, but they can have a big contribution to a level as their powers are focused more on an objective. When you double-tap a butterfly, you will notice that there will be small explosion, which will clear a few surrounding blocks. After that, it will hover to a button or obstacle and collide with it to remove it. In most occasions, the butterfly power-up will usually take out a button or an obstacle which is somehow connected to the current objective. So, if the objective is to clear an X number of red and green buttons, the butterfly will fly to any one of these buttons to remove them from the board. 1. Rocket + Rocket = When you combine two rockets, you trigger a cross-shaped blast that clears a row and column at the same time. 3. Bomb + Bomb = Huge explosion that clears almost the entire game board. 4. Puzzle Cube + Bomb or Rocket or a Butterfly = When you combine a puzzle cube with a bomb, butterfly or rocket, it replicates several power-ups of the same type and spreads them across the board. A power-up and its duplicates detonate after a few seconds clearing a lot of blocks at once. Combining a puzzle cube with any power-up is probably the best way to complete your objectives faster. 5. Butterfly + Bomb or Rocket = When you combine a butterfly with a bomb or rocket, the butterfly triggers a mini-explosion, clearing surrounding blocks and then flies, carrying the rocket and bomb to a block or obstacle. The bomb and rocket explode, clearing several blocks. 6. Butterfly + Butterfly = When you combine two butterflies, three more butterflies are created. These butterflies fly to three random spots on a board to remove blocks. 7. Cube + Cube = The ultimate combo. Combine these two and see the magic! For certain costumes, you will have to earn stars to complete certain tasks in the to-do list, which can be accessed via the diary on the bottom-left corner of the screen. To complete a costume task, you will need a star, which you can acquire when you clear a level. As the story progresses, you will come across several characters. Jamie will try to cheer them up or meet their fashion demands by suggesting costumes of accessories to them. When such a costume objective pops up on the screen, complete a level to get a star and then use the star to complete a task to unlock a character’s costume or accessory. For most characters, additional costumes can be unlocked when you complete a certain episode of a chapter. 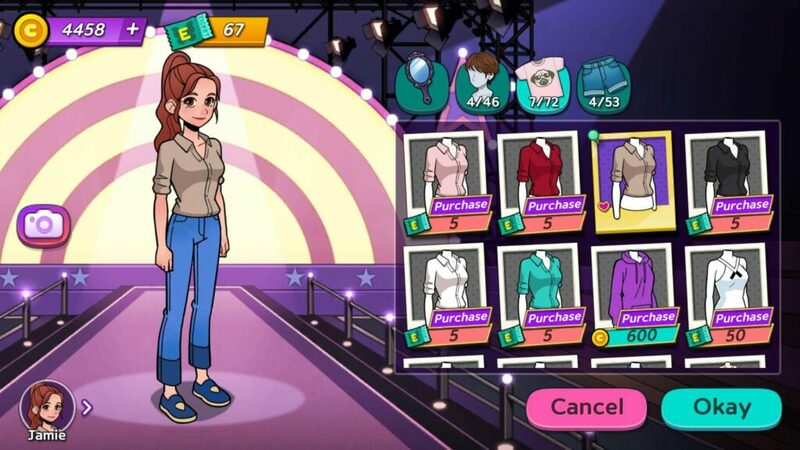 Just tap the hanger icon and then choose a character’s portrait on the bottom left corner of the screen. Now tap his/her locked costume to check unlock requirements. You can unlock additional costumes for Jamie. Tap the hanger icon on the bottom of the screen and then scroll down. Now tap a locked costume or accessory. You will find instructions to unlock them. Once you have unlocked a costume or an accessory, you will need to spend coins or event tickets to purchase them. To unlock certain costumes, you will have to receive daily login rewards for an “X” number of times. For others, you will have to clear a particular match-3 level to unlock them. Event tickets are used to purchase exclusive costumes and accessories for Jamie and her friends and family. You can get event tickets from certain events. 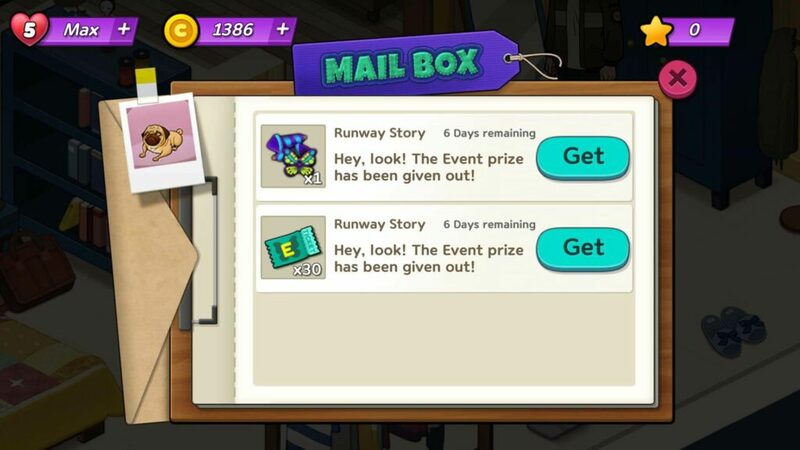 Keep playing Runway Story daily to unlock new events and make sure you have turned on in-game notifications as events will be notified on your mobile phone’s screen as and when they are available. In most events, you don’t have to do anything, juts login to claim your rewards. Tap the envelope icon to get event prizes and claim them before they expire. 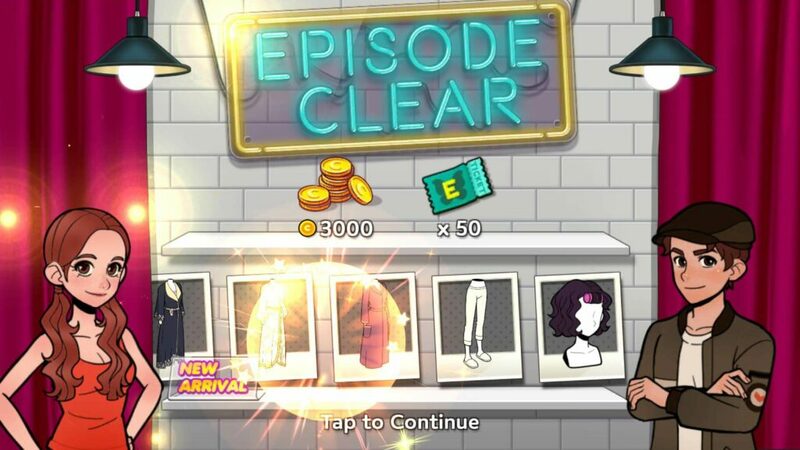 Another way to get event tickets is to complete episodes to get “episode clear” rewards. Tap the diary to check your “To-do” list. Complete all tasks under the to-do list to fill the gift box bar. When the gift box bar is 100 percent full, you clear a chapter’s episode and get event tickets and coins. There are various ways to get coins. You can connect to Facebook to get 1000 coins, login daily to get them on certain days, watch a video or get coins as episode clear rewards. But do you know that you can get extra coins in every level? All you have to do is clear each level before running out of moves. Each unused move will be converted into a power-up, which will then be used to clear blocks. You will get bonus coins every time these unused moves turn into power-ups to remove blocks from the game board.